Linfield extended their winning streak in all competitions to four matches with a comfortable 3-0 victory over Dungannon Swifts. The champions rarely had to get out of second gear and the game will be remembered for a fantastic performance from 19-year-old midfielder Aaron Burns who scored all three of the game’s goals and bagged himself the match ball in the process. He oozed class throughout the game and proved far too hot for Dungannon to handle. The first goal of his treble was the highlight as Burns produced a real moment of quality in the 32nd minute. The teenage midfielder collected the ball on the left wing, ghosted past three Dungannon challenges before composing himself to finish past Morgan on his weaker right foot. The home side’s lead was doubled nine minutes into the second half – Carvill’s neat square ball allowing Burns to tap in from close range. With 20 minutes remaining the hat-trick was secured with another composed finish after a pinpoint through ball by Mulgrew. 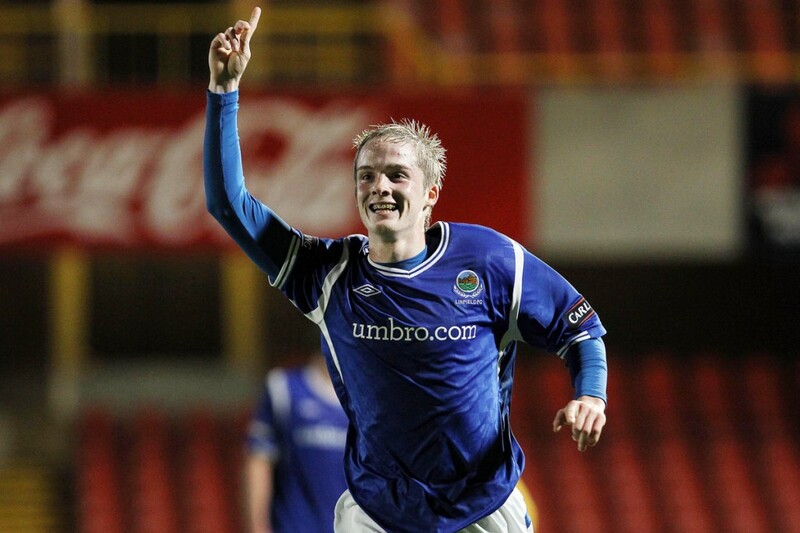 It was the second time in a week that a Linfield player scored three goals at Windsor Park – as Rory Patterson netted a hat-trick in the 7-1 win over Ballyclare Comrades in the Irish Cup the previous Saturday. It was to prove Patterson’s last appearance for the Blues as he completed his move to Derry City during the week. A deal was struck between the Candystripes, Linfield and his parent club Plymouth Argyle to ensure that the international striker would move to the Brandywell on a three-year contract. The move makes sense for Strabane-based Patterson, who will now play his football at a club more local to his hometown, whilst also earning more money. The League of Ireland side had been linked with Patterson for the past few months, and the rumours gathered strength whenever Eamonn Zayed and Mark Farren both departed Derry at the end of November. Then when both the Derry City chairman and new manager Declan Devine were in attendance at Linfield matches in the past few matches to monitor the striker’s progress. Whilst he might have never fully reached his potential at Windsor Park, the striker chipped in with nine goals, including his sign off last week. He made progress despite injury setbacks and despite one or two concerns that he may have had a disruptive influence in the dressing room, this never came to fruition. Rory leaves the club on good terms and due to a gentleman’s agreement – Patterson will not play if his new club meet Linfield in this year’s Setanta Cup. The three players who have departed Linfield on loan this month have had contrasting fortunes. Brian McCaul notched his third goal in three appearances for Glenavon in the Lurgan club’s 3-1 defeat at Coleraine, while Marcus Kane scored on his debut for Carrick Rangers in the club’s closely fought 2-2 draw against Glentoran. However, defender Kris Lindsay has suffered yet another cruel injury setback after injuring the cruciate ligaments in his knee. This rules the defender out for the remainder of the season at least.